Thanks to the publisher and author for a physical copy of ‘The Lamb Will Slaughter the Lion’ in exchange for a honest review. Receiving a copy from the publisher does not influence my opinions or thoughts on the novel. 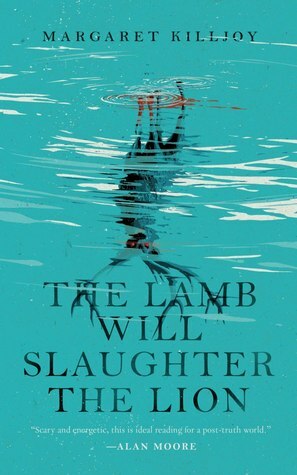 The Lamb Will Slaughter the Lion is another novella that caught my eye because of a gorgeous cover. And yes, the cover directly correlates with the story. Oh, and the fact that ALAN FREAKING MOORE wrote a blurb for it. Danielle Cain lives day to day on the road, and no, I don’t mean as a trucker. She travels from town to town in search of clues that will help her better understand her best friend’s sudden suicide. Until she ends up in Freedom, Iowa. One thing is for sure: something is up in this squatter town, and it has to do with that blood-red, three-antlered deer she saw on her way in. The deer is named ‘Uliksi’ and is a protector spirit for the community. It was summoned to rid the community of those who crave things like power, dominance, or those who wish harm to others, but things have taken a downward spiral and Uliksi has begun killing its summoners. Now, it is up to Danielle and other members of the community to band together and find a way to rid themselves of this spirit before Freedom, Iowa is wiped out. One thing you can always guarantee with Tor.com is that you will, at some point in time, come across a novella that stretches your imagination beyond comprehension. I have read nothing that I can directly compare this read to and that is, IMO, what made it so intriguing for me. Though the novella has its fantasy and horror elements, it also brings up several important topics of discussion about issues we face today. I won’t go into them as other reviewers before me have, but I can see what Killjoy was trying to portray through this piece and I give my props. The author does a fine job of instant engagement with the reader’s first glimpse of Uliksi, leading the mind to wander as to what the hell is going to happen next. The unknown is always such a powerful hook with horror novels/novellas and Killjoy nailed it. I also really enjoyed the character developments throughout as we are given several different perspectives on what is at hand, and the ability to see Danielle grow with this experience was fantastic. I am looking forward to reading the sequel, The Barrow Will Send What it May, which was published back in April, and seeing where Killjoy sends Ms. Cain next.